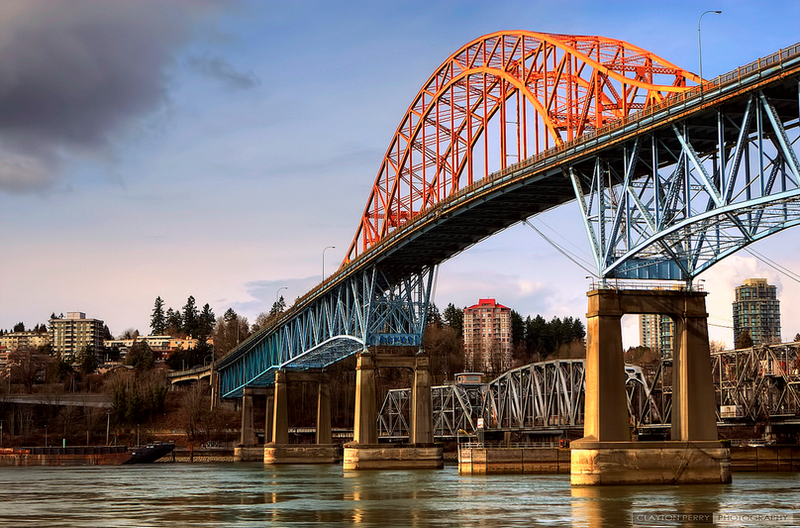 What now for the Pattullo Bridge? The Pattullo Bridge needs replacing. Built 80 years ago but designed to last 50 years, it desperately needs replacing. River scour is causing foundation issues. The reinforcing steel is corroding. The concrete is degrading. The lanes are narrow and dangerous. It needs to go. TransLink has a plan for replacing it, with a new bridge planned to open in 2023. In 2014 New Westminster city council did a road tour around to other councils in Metro Vancouver to push for a four-lane tolled bridge — at the time Surrey wanted a six-lane bridge. Surrey agreed that a four-lane bridge would do, as long as it could be easily expanded to six lanes should vehicular traffic volumes dictate it. In 2016 Surrey, New Westminster, and TransLink agreed that the new Pattullo would be tolled. This is important, as the toll would help to shape traffic patterns (along with the tolls on the Golden Ears and Port Mann bridges, and on the future Massey Tunnel replacement bridge) and, more importantly, pay off roughly half of the cost of building the bridge. And then a couple of days ago the BC Liberals said they’d cap bridge tolls at $500 per year. The BC NDP one-upped them, saying they would completely eliminate tolls. So what does this mean for the Pattullo Bridge replacement? All of a sudden TransLink has lost about $500 million in toll revenue that they were planning on using to pay off their portion of the construction of the Pattullo Bridge replacement. Where does that money come from? The bridge needs to be replaced, that can’t be put off. But an organization with an operations budget of around $1.6 billion can’t magically pull $500 million out of a hat. Do they have to cut operational funding, which means cuts in service? Do they cut other capital projects they were planning, like the Surrey LRT or the Broadway SkyTrain line? Do they raise fares? All of a sudden the two largest political parties in BC have thrown this planning into disarray. They’ve shown that not only are they willing to ignore the Mayors Council and TransLink, who have worked hard over the past five years to come up with plans to improve transportation in Metro Vancouver despite a hostile provincial government, they’re also willing to ignore decades of studies in transportation planning that show that congestion charges or mobility pricing, when instituted in conjunction with increases in public transit funding and availability, are the best way to fight congestion. Instead they’ve both gone with populist policies that will only serve to get them elected, and will set the region backwards five to ten years. The BC Liberals and the BC NDP need to tell New Westminster and Surrey how the new Pattullo Bridge will be paid for, and they need to tell us before we all vote on May 9. I stumbled upon this blog today and I am seriously going down the rabbit hole reading through a bunch of your (collective) posts. You strike me as an educated and well read couple that values logic and science to back up local and provincial decision making…. if this could only be a realistic expectation for every politician. I really like what you are writing on this blog and wanted to give you kudos on the good work. With respect to the Pattullo Bridge, I’m not sure how all of the jurisdictional areas work out, but my recommendation is that both Surrey and New Westminster restrict the height of vehicles travelling on the bridge until the bridge is renovated. This would have the double benefit of reducing traffic through New West and reducing the degradation from excess weight on the bridge. As a new resident to New West (as of June 2016), I’m equally impressed with this city and excited about its potential. I would love to spend some of my time pushing for more smart policy in the city, so please let me know if you need any help.